It’s no doubt everything from the over the top looking artwork, album title, and decision to work with the eclectic Brian Burton (better known under the name Danger Mouse) prefaces an aspect of Jones not disclosed too deeply in her artistic vision thus far. But, after eight years together Jones and Lee Alexander had broken up and it’s no wonder why this obscure departure has found us a collection of twelve tracks filled with heartache and the raw, post-split sentiments that come along with it. It’s more solemn than aggressive, but extremely effective in it’s delivery as a cohesive record. In it’s opening number, “Good Morning” begins with a dreamy synth line which contains an abundance of reverberation that it sounds as if a lethargic dreamscape has infiltrated the mix. Soon after, an imperfectly recorded electric guitar, panned to the right and filled with noise floor, compliments the main instrumentation and causes a nice mid-range grit that makes way for an open niche for Norah’s vocals to shine. The vocals are mixed up front, extremely compressed and equalized more toward the high frequencies to give a dramatic, breath-like feeling and create a somber disposition. A slight delay, mixed a bit lower in the mix, is also added for emotional appeal as well as to continue the consistency of the spaced-out feeling which it delivers. As the song unfolds passed the chorus, stringed instruments make their way into song, along with several other synth elements and find themselves ebbing and flowing throughout both channels of the stereo mix, but more on the left side to counteract Norah’s guitar playing. The additional layers vastly help fill the track with even more sensations of creating a aural interpretation of morning. The feeling of waking up, the feeling of brightness encompassing someone, but combining what one normally associates with positivity, instead, with melancholy. Lyrically, it’s frank and honest. Something we’ve seen Jones become quite good at over the years. “Good morning. My thoughts on leaving are back on the table. I thought you should know. And maybe powerful actions or powerful feelings will keep me from going. I’m folding my hand.” There’s nothing hiding in these words and when it comes to the disintegration of romance, the brutality and desolate disheartenment is undeniably present. Picking up the pace, “After The Fall” barrows from the feeling of dub music while teetering upon reggae influences, but also maintaining an alternative perspective. Possibly named in reference to her 2009 LP The Fall, “After…” finds Danger Mouse thrusting the mourning artist out of her comfort zone as distantly as we’ve seen and effortlessly creates genre-crossovers seamlessly, without seeming over-ambitious. Delays, small snare drum rolls, and a trippy-plucked synth melody surrounds the track as she states “You couldn’t come through and I’m too far gone.” Lyrically, the line sounds as if it was something The Weeknd would pick up on and is one of the most surprising vocal lamentations we hear on …Little Broken Hearts. “Happy Pills” also takes a poetic departure from the upfront songwriting technique that’s been incorporated and acclimated into Jones’ works since her debut. While in our track review of the song we stated it was still quite a straightforward declaration, the interesting concept of the track and line “with you gone I’m alive, makes me feel like I took happy pills and time stands still” shows an overall more unique and skewed vision. It’s playful, but rude. Confident, but sorrow filled. Many instant and intricate feelings are thrown into this track. It’s the most produced and makes it seem as if it’s the “Chasing Pirates” (from The Fall) of this album, so it’s easy to see why it was chosen as lead single. (Check out our single review here). Perhaps the most interesting part of …Little Broken Hearts is “Mariam” in which the subject of infidelity runs rampant through the song’s four minute and a quarter run. Obviously, it’s directed at an antagonist named Mariam whom an affair with someone else’s lover. The kicker? While she starts off telling the woman she has a pretty name, she kills her at the end of the song. That’s right. If there was any indication that this is a completely different Norah Jones, it’s this song. To top it off, “Mariam” contains instrumentation that drags on, but marches with it’s percussive section as to create an eerie setting for the horror-esque fairytale that brings the album artwork to the sly life that it represents. Backtracking through the record, “Say Goodbye” features guitar and vocal fluttering effects. Interestingly enough, the flutters are on the stereo delay/background vocals and are set at a rate that’s fast enough so that it creates a subtly, but slow enough as to enforce the effect that’s overcome Norah’s voice. Harmonies flawlessly join in through the bridge and the chorus and are smartly pushed forth in the mix to ensure that no frequency battles or flawed representation within the layers is heard. During the second verse, a small supportive synth line comes into play after each of the vocal stanzas and lightens up the feeling of the song. It’s a nice break, considering the dismal overcast …Little Broken Hearts embodies. The bulk of the record seems to feature really old recording techniques or nice plugins and EQ techniques that help give a throwback vibe and old school heartache to the album. It’s most apparent on “She’s 22” and guides its way through the album’s forty-four minute run. Normally, it takes quite a few listens to understand the microscopic bits and pieces of what’s actually happening as a lyrical and musical piece of a whole on a Norah Jones Record. They seem to stay in one place sonically, while subtly exploring musical and mixing techniques. It helps blend together the album into one whole piece and with …Little Broken Hearts it’s no exception. While it’s her loudest record to date (sitting at at an average of 7 decibels of Dynamic Range) and suffers from distortion (though probably a technique applied on purpose considering it’s attempt to sound dated), it’s loud with dignity. Altogether, the mixing drives the artistry together to make the most unique Norah Jones album to date. 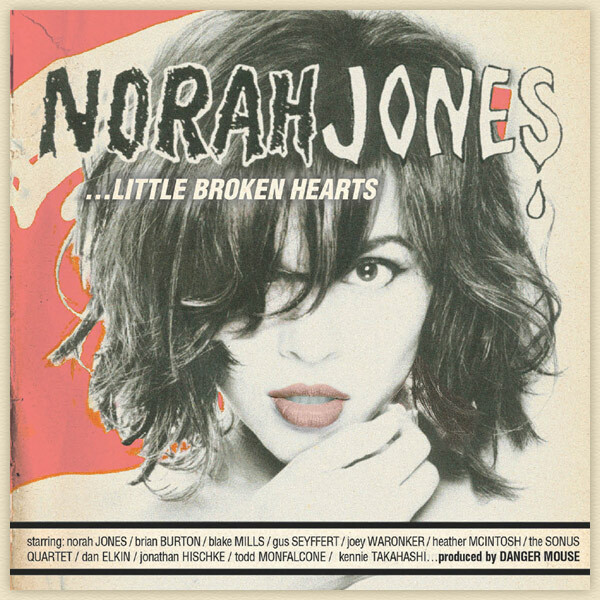 It’s also interesting to note that Norah Jones had a hand in playing eight instruments on this album: Rhodes, Wurlitzer, Electric Guitar, Bass, Acoustic Guitar, Organ, Piano, and vocals. While it’s no surprise given the extraordinary talent she is, it’s of note that when you also add in the songwriting aspect and outside the box vision of …Little Broken Hearts it’s safe to say she gave her all on this one, most of all. It’s real, it’s honest, it’s relateable, it’s exploratory, it’s everything that goes on inside a Broken Little Heart. This entry was posted in album review and tagged ...Little Broken Hearts, Brian Burton, Danger Mouse, Lee Alexander, Norah Jones, the weeknd. Bookmark the permalink.